Founded in 1992 by Dr. Andre Oberle and Associates, Farmington's Veterinary Clinic of the Mineral Area is a full service animal hospital providing services for pets and large animals in St. Francois and surrounding counties. We provide a wide range of medical and surgical services for ill and injured animals, but our model of care is focused on providing each animal with the full benefits of preventative medicine delivered at an affordable cost to their owners. 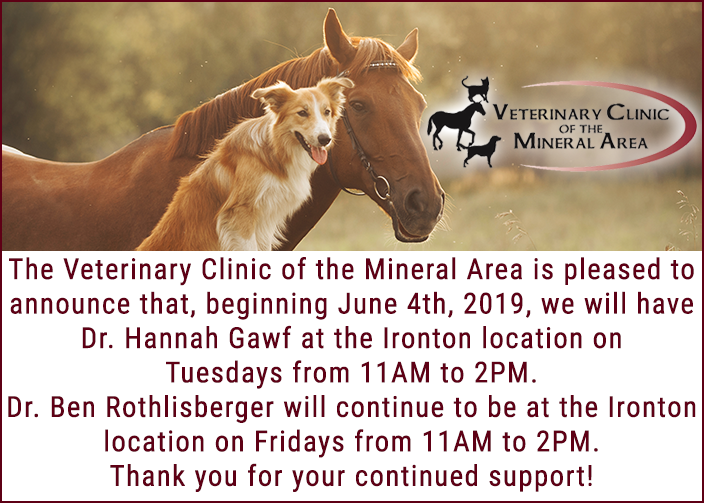 Please browse through our website to meet our Farmington veterinarians and staff, review our services and learn more about our facility, then feel free to give us a call to set up an appointment. We are sure you will see why our Farmington, MO veterinary clinic was voted Best Veterinary Clinic by Insider 573 Magazine's readers.